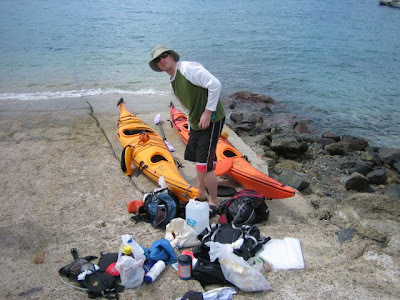 Here is European paddler Paul Murray giving a simple example of all the gear that can go into a kayak for a trip. Some expedition kayakers, out on the water for a week or more, pack well over 100lbs of gear. One small but tangible benefit of a sectional takeapart sea kayak is that one could pack the kayak segments at home, carefully and thoughtfully in the comfort of your garage. Whereas you are unlikely to pack a full size kayak with gear and then cartop it (hernia-inducing), one could pack each individual segment of a takepart boat and then stow each piece in the transport vehicle (usually a van or truck). When you get to the launch site, instead of a disheveled mess of gear that now needs to be stowed, you already have the bow and stern segments fully packed. Instead of empty weight of 20 lbs per segment, they might weigh 30-40 lbs per segment packed, but still full manageable to carry down to the waterside to make the kayak. Even for day trips, keeping the basic gear (e.g. PFD, paddle float, pump, et cetera) in the middle cockpit segement at all times means that essential gear is less likely to get forgotten at home. And the boat is always carried inside the vehicle, so theft and wind are non-issues for your gear.